The JobWalk App is the easiest way to contribute to your HoloBuilder project on-the-go. Learn how to add 360° photos and create a tour here. Before taking photos you should first upload at least one sheet to your HoloBuilder project. To then take photos, you need to connect a 360° camera. You can find information on this in the instruction manual for your 360° camera. Additionally, we provided more detailed instructions and a list of all compatible cameras in a separate article. Place your 360° camera in the room where you want to take the 360° image. Tap in a room or any other location on the sheet to open the context menu. Tap on 'Capture' to trigger the 360° camera. While the image is loading, you can already name the room. After loading the image is finished, you can take a look at your 360° photo. If you are satisfied with the image, tap ‘Confirm’. If you want to retake the image, just tap ‘Retake’ to take another shot. To edit and change the rooms name, tap on the edit icon. You can also delete the whole room by tapping the delete icon. A yellow circle on the sheet, also called ‘waypoint’, indicates in which rooms you already took pictures. To retake the picture, rename the room or remove it from your tour, tap on the corresponding waypoint and select the ‘Open’ function. You can rename the whole tour by tapping the edit icon when in the project overview. Once you have finished your tour, tap the upload icon to queue it for upload to your HoloBuilder account. It is possible to insert direct links between the scenes in the app. Open your project and select ‘EDIT TOUR’ in the menu. Select the sheet you want to edit the scenes off. Tap on a waypoint on the sheet and select ‘Open’ to edit the scene. The link scene icon opens the ‘Pick a scene to link to’ list. From that list, select the scene you want to link to. To delete a link, tap on the link in the scene and select ‘DELETE’. Or, edit your complete project in the web editor. Make sure to synchronize the version on your mobile device with the cloud so that you edit the most recent version of the web editor and no progress gets lost. 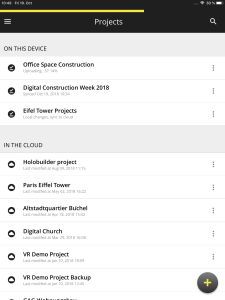 To upload the tour to HoloBuilder and make it accessible in the cloud from wherever you are, your smartphone needs to be connected to the internet. By default, JobWalk only uploads tours via Wi-Fi to slim down your data usage. You can change this in the app’s settings. If you do not have access to the internet at the moment, or if you want to create another tour just tap the upload icon to queue it for upload and carry on. 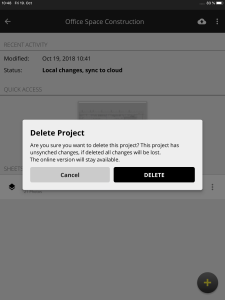 If you forget to upload your scenes, because you are waiting for a better internet connection and try to delete a project that has unsaved changes the JobWalk app will warn you.